Teopanzolco is a religious complex locked within the suburbs of modern-day Cuernavaca, just a few hundred metres from the city’s centre. Cuernavaca and Teopanzolco are located on the edge of a lava flow on the southern slopes of the Sierra de Chichinautzin mountains and at the heart of the high plains surrounding the Trans-Mexican Volcanic Belt. It would be hard to find a more blessed spot for a civilised agricultural community to grow, and an archaeological site discovered in northern Cuernavaca in 1934, known as Gualapita, revealed burials dating to the Early Formative Period (1100 – 900BC). Gualapita is thought to be an Olmec settlement and ceramics found at the site demonstrate that it was still being used until at least the Late Formative Period. However, the inherent gains of living on a volcanic plain, rich with fertile soils and an eternally warm spring-like climate, are tempered by the intrinsic dangers posed by the looming volcanoes, and between 245-315AD the area was decimated by the eruption of Mount Xitle. A flourishing city named Cuicuilco, which was located 23 miles north of Teopanzolco, has been discovered buried beneath the flow and many more may lie buried. The pyroclastic flow of red-hot gasses and the dense black cloud of ash would have undoubtedly hit a vast area and left the region inhospitable for some time. Those forced to flee the area are thought to have migrated to Teotihuacan, just 33 miles north-east, where evidence of their influence can be found during this time period. 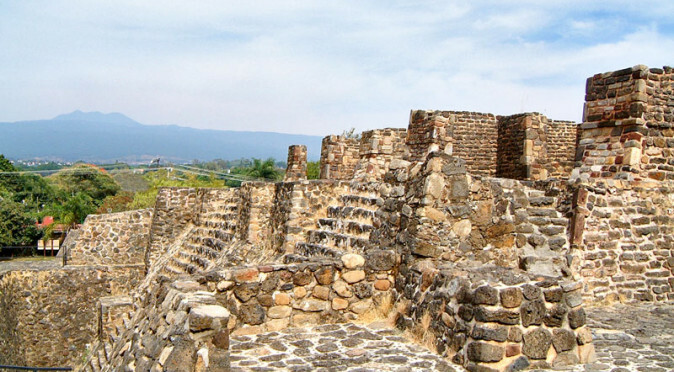 The Legendary ChicomoztocThe lack of archaeological finds around Cuernavaca following the eruption suggests the area became uncivilised for a very long period and it was the Tlahuica who were first to migrate back from the highlands in the 12th century. The Tlahuica are one of a group of peoples associated with a legendary cave-dwelling known as Chicomoztoc, located in a semi-mythical land named Aztlan. From the cave, it is said, seven tribes were born, each of whom migrated south to inhabit the lands of Central Mexico. 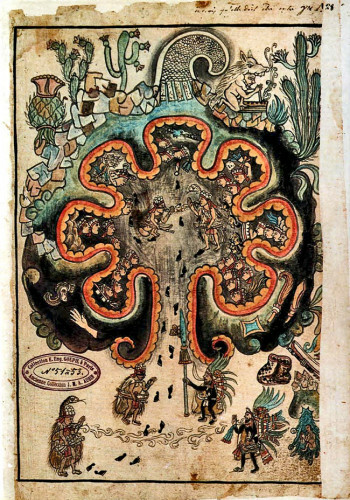 The seven tribes are thought to be all the cultures of Central Mexico that spoke the Nahuatl language, which includes: the Xochimilca, Tlahuica, Acolhua, Tlaxcalan, Tepaneca, Chalca, and Mexica (who were confusingly renamed Aztec in the 18th century to avoid confusion with modern Mexican’s). This primordial clan is also known as the Chichimecs and a legendary Chichimec ruler called Xólotl is believed to have conquered the majority of lands in Central Mexico during the 13th century, which put Cuernavaca under the jurisdiction of the city of Texcoco. The Tlahuica are thought to have started construction at Teopanzolco during the period between 1150AD and 1350AD – a time-frame termed as the Early Aztec or Early Postclassic Period. 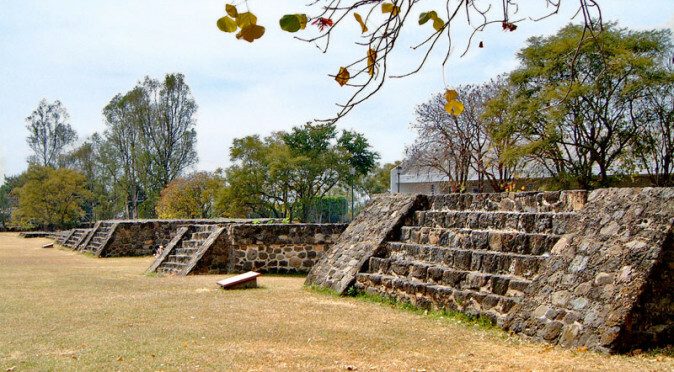 With its twin-stair design, the Great Platform at Teopanzolco is certainly in a style favoured by the Aztec and may have been the prototype for the Templo-Mayor, which was built at the centre of the Aztec’s mighty capital, Tenochtitlan. On top of the Great Platform are the Temples of Tlaloc and Huitzilopochtli, with the latter being a God particular to the Aztec. 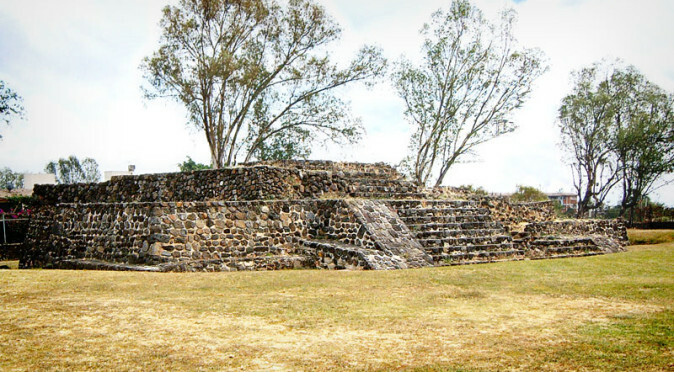 This means at least a part of Teopanzolco was constructed by the Aztec, rather than the Tlahuica. With signs of inhabitance at Teopanzolco pre-dating the construction of Tenochtitlan in 1325AD, it is possible that construction took place here whilst the Mexica were a semi-nomadic tribe searching for their prophesied home-land – which would explain why the rebuilding of the temple was curiously abandoned midway through construction. Alternatively, construction may have followed Emperor Acamapichtli’s invasion during the AD 1370’s. Aztec interest was centred around cotton production, which had become a major trading commodity in the area – then known as Tlalnahuac. Acamapichtli’s successor, Huitziliuitl, had designs on the Tlalnahuatl Princess, but his desires were rejected and a war ensued. The war was finally ended with the marriage being accepted and their child would later become Moctezuma I. Records state that Moctezuma I went on to conquer Tlalnahuac in the early 15th century and it became the Aztec dominion of Cuauhnahuc, which translates to “surrounded by trees”. The name was later translated into Cuernavaca by the Spanish invaders. The name Teopanzolco translates to “abandoned temple” and the city takes its name from a temple that was abandoned midway through its reconstruction. 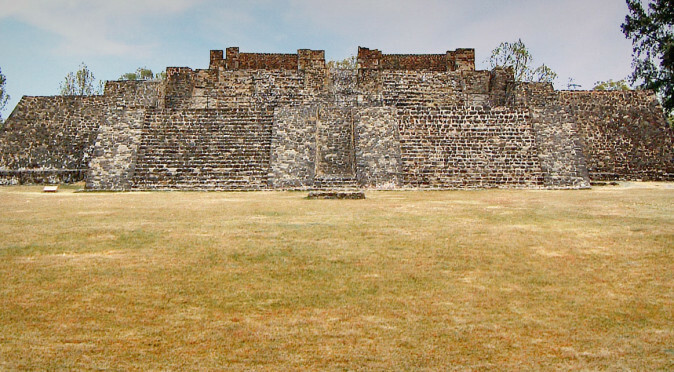 Mesoamerican cultures are known to have ritually buried their temples within new temples in an act of rebirth, and at the centre of Teopanzolco’s ceremonial square you can see this process was half completed. The magnificent Great Platform would have gone on to be a huge pyramidal base measuring over 20 metres tall, with a footprint of 50m x 32m. However, for some reason work was abandoned and no-one is really sure why or when the people of Teopanzolco downed tools and left the site. The most obvious answer is that the Spanish arrived, however, archaeologists believe Teopanzolco was abandoned much earlier than this, with focus shifting to a new ceremonial centre at Cuauhnahuc. 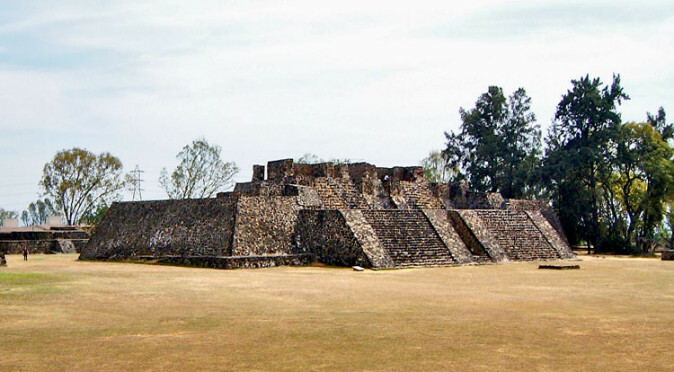 Archaeology has determined that both the Mexica and the Tlahuica occupied the site and possibly during the same period. So the most likely suggestion is that the complex was built at the turn of the 15th century following the union of Huitziliuitl and the Tlalnahuatl Princess. The reason why it was abandoned is a mystery. 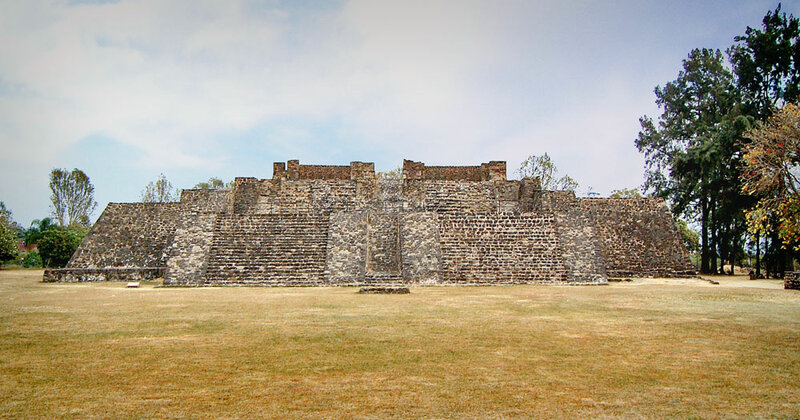 This mystery remained hidden beneath the overgrown outskirts of Cuernavaca until 1910, when Zapista rebel forces found the huge mound was a prime location for their artillery-placement. Whilst bombarding Cuernavaca’s town centre with rumbling canon, their elevated position started to collapse and the incomplete Great Platform revealed itself for the first time in several hundred years. The site was then excavated by Alfonso Caso during the 1920s – and it is uncertain if he deliberately exposed the inner temple of the Great Platform or whether is was abandoned by its builders in that state. Teopanzolco is found locked within the suburbs of Cuernavaca, less than 2hrs from Mexico City, and was mysteriously abandoned mid-construction. 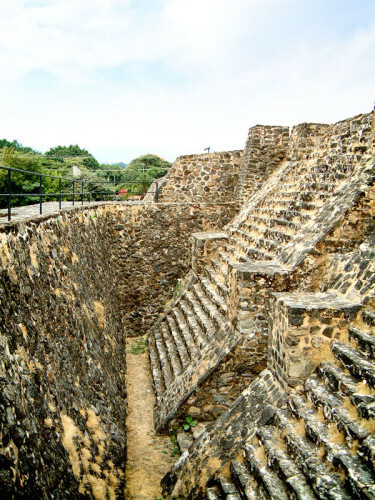 The Twin-Stairs of Building 1 suggests that temples would have been dedicated to Tlaloc & Huitziloopchtli and the builders would be Aztec, so why was it abandoned? Along the west flank of Teopanzolco's ceremonial centre lies a row of 7 enigmatic altars, two of which are distinctively circular - one of which contained human skulls. The Temple of Tezcatlipoca played an unusual role in the Aztec calendar by hosting the bloody culmination of a year long celebration to the God Tezcatlipoca.